Russ Kemmerer was one of the first retired major league players that I interviewed in my quest to put together a book about playing through baseball’s integration of the 1950s. 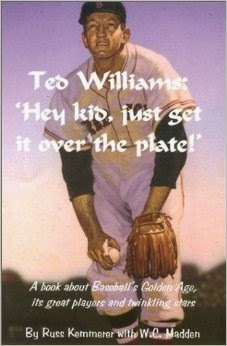 What started out as a discussion of his early years in the Red Sox minor league system, turned into a two-day, hour-and-a-half phone conversation that ended with him sending me a copy of his book, “Ted Williams: Hey Kid, Just Get It Over the Plate,” just because he knew I would enjoy it from our talk. Kemmerer was a standout high school athlete in the Pittsburgh area at Peabody High School, earning All-City honors in baseball, basketball, and football. His talents earned him a scholarship to the University of Pittsburgh, where he played freshman baseball and basketball. After one year at Pittsburgh, he signed with the Boston Red Sox in 1950 after an offer of $3,000 by scout Socko McCarey. He spent the summer playing semi-pro ball in his hometown before officially entering the Red Sox organization in 1951. It was there he encountered a minor league system overflowing with talent. He made his debut with the Red Sox in 1954 and narrowly missed a no-hitter in his first start. In the seventh inning on July 18, 1954, Sam Mele hit a shot to left-field that barely evaded the outstretched arm of Ted Williams. Kemmerer played until 1957 with the Red Sox until he suffered an arm injury while playing winter ball in Puerto Rico right before the start of the 1957 season. The Red Sox instead of waiting for his arm to heal, traded him to the Washington Senators. 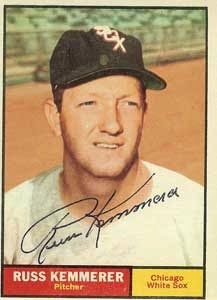 Kemmerer ended up playing nine seasons in the majors, also spending time with the Chicago White Sox and the expansion Houston Colt 45’s. He recalled the follies of playing for the formative years of what is now the Astros franchise. He took his experiences from the big leagues and used them to help shape the lives of the next generation, working for over 20 years as a high school English teacher, as well as a baseball and football coach at Lawrence Central High School in Indianapolis. In retirement, Kemmerer married both of his careers with his 2002 memoir with the title containing a tribute to his most famous teammate. Kemmerer forged a relationship with Williams that lasted until his 2002 death, appearing at annual gatherings at Williams’ museum in Tampa. He appreciated the humility of Williams and the other stars of his era. Speaking with him in 2008, I was most impressed with how willing he was to talk about the game and the many travels of his career. He relished the opportunity to interact with his fans whether it was by talking on the phone or responding to autograph requests in the mail.